Found this when I was looking through one of my old sketch books,nothing more than the good old black biro was used. It seems to me that most graphic novels of movies tend to be poorly done. Uninspired. How's that me ol' mucker,fits a bit better now,sorry ,bout that. 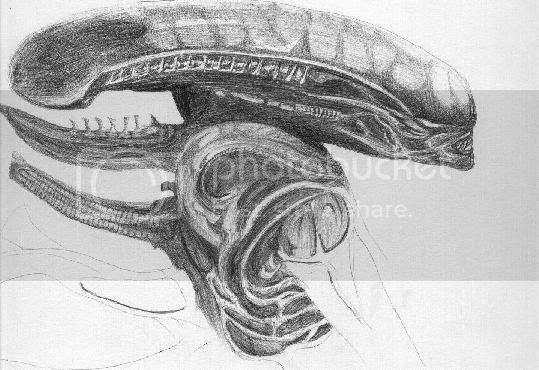 The great thing about doing creature designs is that there are very few paramiters to adhere to so anything goes,especially with Giger type stuff. I worked on a comic once with a friend of mine,it was a homage to all Zombie films,we called it "The evil zombie massacre",it was a tongue in cheek style script with appropriate drawings,the twist was is that it was the living that were the evil ones,the zombies just wanted to get back to hell where they were quite happy thankyou very much but were type cast as evil thanks to the likes of Fulci,Carpenter and all the other zombie film makers,my friend has still got the original somewhere,i'll see if I can get it off him. o.k I'll go an' fire up the light house an' meet you half way!! hey there Lt Gez,good to have you on board,the more the merrier. Yeah, I see what you mean, still, I don't think they handled the suspense very well. And most of the differences from the movie were because they worked with an earlier draft of the script. There's the scene where they listen to the derelict's transmission, that wasn't used in the theatrical cut and a lot of dialogue that is from the script, but wasn't in the movie, 'cause they improvised a lot.